National Cooperative Grocers Association is a business services cooperative for retail food co-ops located throughout the United States representing 136 food co-ops operating nearly 180 stores in 37 states and a powerful advocate for food co-op issues. NCGA provides members with operational and marketing resources, professional development and training as well as product selection and sourcing. The Challenge: A complex existing development project that had stalled. NCGA came to Drupal Connect seeking a technology partner to audit a partially developed website. The ncga.coop/ website is primarily a library of resources for the members of the cooperative. There’s very little content that’s exposed externally but mechanisms were required to give registered site users tools to navigate to content that could address their needs. The common complaint from site users was their frustration with being unable to locate certain resources. It was clear to website stakeholders that a significant number of the NCGA membership were simply not using the website. The existing structure was not conducive to the kind of multifaceted search that could help users reach resources using various types of queries and search techniques. After a thorough site evaluation that included an information architecture review, Drupal Connect recommended starting from scratch with an all new content model that could leverage faceted search using Apache Solr. Programs and services content employed a nested hierarchical display so that the resource categories could be scanned quickly and efficiently. 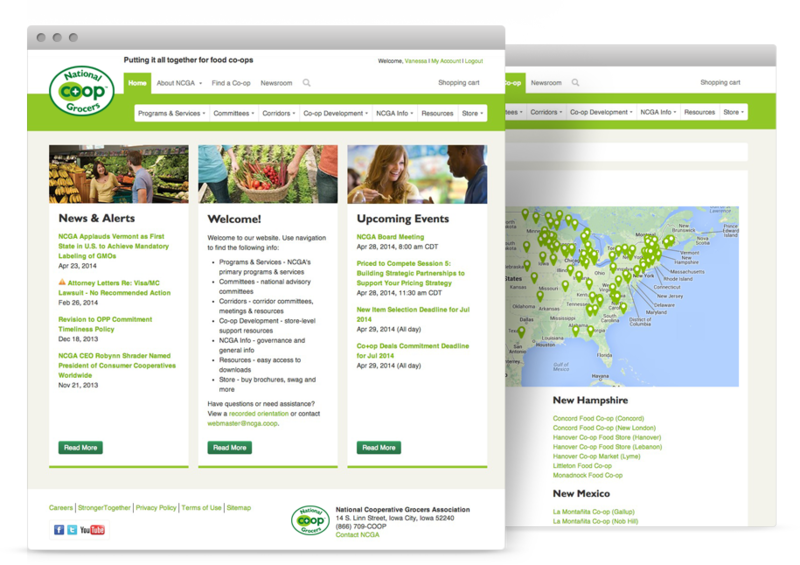 Leveraging a complex user access model, the site offers a wide range of site users - from NCGA staff, to Co Op general managers, to Co Op Marketers - differing levels of access to various types of content. The NCGA store houses both NCGA merchandise (logo hats and posters) as well as resources available for purchase. The site offers custom administrative reporting tools, such as the Contact Mailer which allows for creating mailing lists by position, corridor and chapter, as well as searchable directories for member organizations each with a hierarchy of group members.